Fiscal Futures: Can Public Finance Save Democracy? Recall the famous battle cry of the Boston Tea Party, ‘no taxation without representation,’ and acknowledge that control of public resources — the manner in which they are generated and spent — is a central feature of the modern liberal democratic project. What then is the future for fiscal accountability when its enabling political framework — liberal democracy — is under threat? There is no need to provide a lengthy defense of the underlying assertion, namely that liberal democracy is indeed under severe threat. The alarm bells are ringing for all to hear: they ring loudly in several advanced liberal democracies in which ‘fortress democracy’ once appeared impregnable. Leading the pack is Donald Trump’s U.S., with Italy and Austria right up there. Even benign social democratic Sweden is home to thoroughly anti-democratic forces. These forces are ascendant in some leading new democracies — think Russia, Poland, and Hungary. And they are claiming the political systems and identities of several important large middle-income and developing countries — Turkey, the Philippines, Brazil, and the vaunted Indian democracy. While each instance of transition from democracy to authoritarianism is deserving of its own account, there are several strikingly common features. Each of these transitions has been driven by a democratically elected leader — the generals and colonels of yore are, with few exceptions, conspicuously missing in action. No sooner have these demagogues been elected to office, than they turn on the institutions of the democracy. The possibility of future electoral defeat is forestalled by gerrymandering and other means of electoral manipulation. Parliamentary opposition is demonized, treated as enemies of the state rather than political opponents, or bought. Then the judiciary and key law enforcement and regulatory agencies are captured, usually by utilizing the powers of appointment to senior positions enjoyed by the head of state or weakened and deeply divided legislatures. Then the traditional institutions of restraint, such as civil society organizations and the media, are vilified — often by casting them as unelected elites in thrall to sinister foreign agencies and individuals. The hollowing out of the democracy, represented by the neutering of the institutions of accountability and oversight, is inevitably and sometimes paradoxically followed by an upsurge in corruption. ‘Paradoxically’ because some of the demagogues — vide Brazil and India — have come to power on the back of popular outrage at burgeoning corruption. It is the combined effect of the legislature, the criminal justice system, the regulators, the media, and civil society that hold the executive accountable, and that prevents capture of the executive arm of the state by moneyed interests. Remove these essential props of the democracy and all bets are off. The economic and fiscal architecture of the state will, of necessity, be an early target of the corrupt political elite and their business cronies. South Africa, under Jacob Zuma, is an interesting case in point. It being South Africa, the lucrative, but heavily regulated, mining sector was an attractive target for Zuma’s moneyed co-conspirators and so, drawing on the presidential powers of appointment, the minerals ministry and regulators had to play ball. Public procurement was an obvious target, but in order to corrupt that system it was necessary, but insufficient, to capture the boardrooms and executive suites of the large state-owned enterprises. Given that the members of this corrupt conspiracy preferred not to pay tax, but principally because they could not declare their ill-gotten gains and expose themselves to the enforcement powers of the tax collector, it proved equally necessary to capture the national treasury: the custodian of the public procurement system and the South African Revenue Service. And the Financial Intelligence Centre had to be captured because of its role in monitoring suspicious banking transactions and unmasking attempts at money laundering. And the central bank had to be captured for its role in regulating cross border flows of money. History will record that much of this was actually achieved although the state capture project ultimately foundered when it became necessary to capture the ministry of finance, the pinnacle of fiscal policy, although not before major damage had been inflicted on these institutions and, with it, the South African economy. There are some salutary lessons from attempts to capture the state’s fiscal institutions. Pre-Zuma South Africa boasted fiscal institutions that were not only characterized by the integrity of their leadership but also by their technical excellence. Think especially the National Treasury, the South African Reserve Bank, and the South African Revenue Service, which was widely regarded as one of the most effective revenue collecting agencies in the world. Yet this once impressive institution was trashed in a fraction of the time it took to build. Hundreds of key staff were driven out. Some of them were targets of bogus criminal investigations. Investigative and enforcement structures were disbanded in their entirety. All that it took to initiate this once proud institution’s destruction was the appointment by Zuma of a corrupt and ruthless crony to head the agency. This experience points to some obvious reforms that are needed. For example, the process of appointing the head of the South African Revenue Service needs to be more transparent and democratic, and removed from the sole discretion of the President. The governance structure — the head of the Revenue Service appointed by the President but accountable to the Minister of Finance — requires urgent reform. But the key lesson is that while technical competence and the relative autonomy of the technocrats is a necessary condition for effective fiscal management, it will ultimately bend in the face of a corrupted political framework. Why did the National Treasury and the Reserve Bank prove so difficult to capture? Essentially, while the public and powerful interest groups may be prepared to accept the presidential prerogative to appoint the cabinet, this does not extend to the finance minister. With an eye on the response of international financial markets, post-apartheid South African administrations have appointed technically competent and unimpeachably honest finance ministers. Successive attempts by the Zuma administration to upend this pattern — including the appointment of an incompetent crony who lasted just 4 days in office — were met by the swift and predictable condemnation of international lenders and investors which in turn galvanized an increasingly troubled domestic private sector. 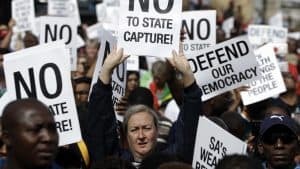 This pressure — coming on top of a vigilant civil society and independent media — proved a bridge too far for the state capture project. This may well be a case for the disciplining effect of globalized markets. What these two cases certainly illustrate is the overriding role of politics — ‘bad’ politics destroyed the technically competent South African Revenue Service and ‘good’ politics saved a technically competent treasury. Can the formal structures and mechanisms of liberal democracy be reinvigorated, a process which involves rethinking democracy rather than merely seeing off the demagogue? Can liberal democracy separate itself from neo-liberalism, from an economic order characterized by widening inequality? Are global markets compatible with muscular nation states? These questions go way beyond the narrow, often technocratic questions raised by the fiscal accountability community whose proposed solutions often seem to revolve around searching for better techniques for presenting and disseminating information, solutions that presuppose a functioning democracy. Moreover, these larger questions will not be addressed in the absence of an active civil society. At the very least, greater access to information has to be generative of enhanced political mobilization. For example, Corruption Watch, the South African civil society organisation for which I work, is about to launch a campaign aimed at strengthening police accountability. With community mobilization and activism front and center of our objectives and operating model, the data that we will gather and disseminate will not focus on the eye-watering national police budgets but will rather seek to reveal the resources available at a local precinct level — how many detectives in your precinct? How many police vehicles are allocated to your precinct? What is the name and telephone number of the station commander? Are there dedicated facilities for dealing with gender-based violence? And, above all, how do these data compare with neighboring communities and the rich suburbs up the hill? To stay relevant and reinforce democratic space to operate, civil society needs to be more focused on connecting fiscal issues to what communities immediately care about and in turn will engage on. David Lewis is the executive director of Corruption Watch, a non-governmental organization working to fight corruption in South Africa.